In this article, we will cover the common details that all Cartier glasses are known for and in turn, share the differences between authentic Cartier glasses vs. fake Cartier glasses. The general fundamentals joined with the precise details shown below will give you the knowledge necessary to ensure that you are purchasing authentic Cartier frames. The first thing to look at when trying to determine if you have purchased real Cartier eyewear is the overall quality of the frames. Paint wearing or chipping, as well as misspellings, are easy indicators of fake Cartier glasses. Below are seven areas to examine when determining if you have purchased authentic Cartier eyeglasses. 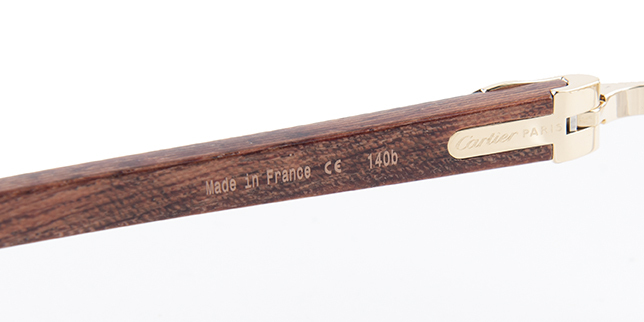 The majority of Cartier glasses have their logo stamped, or etched onto the lens. The key difference here, from many of the fakes, is the quality of the stamp. Frequently, the counterfeiters will use a cheap screen print method to stamp on the Cartier logo. 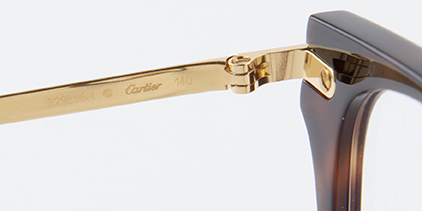 The screen print method gives the logo no texture, whereas an authentic pair of Cartier glasses has a logo with a texture. An easy test to see if you have purchased fake Cartier glasses is by running your finger over the lens stamp—if it is counterfeit, you will not feel anything. On an authentic pair of Cartier glasses, however, you should be able to feel the etching or some type of texture. This easy test will indicate if you have purchased authentic or counterfeit Cartier glasses. Authentic Cartier bridge piece separating the two lenses should feature the bridge measurements. In some cases, the model number is printed here as well. In our example, the bridge piece gives the width of 20mm. The etching should be centered within the bridge piece. Just because these details are present in an area that is unlikely to be seen does not mean that the quality of the glasses should degrade. Every detail, regardless of the function or the area it is found in, should maintain the same level of uniform Cartier quality. 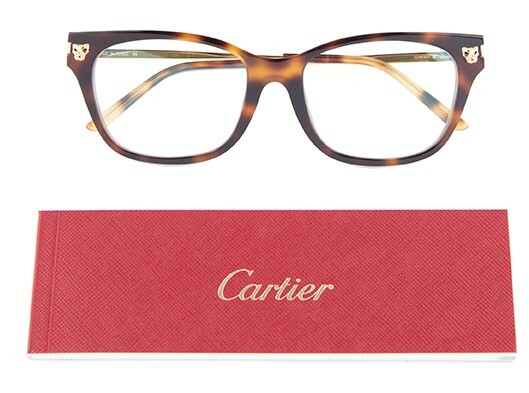 Shop authentic Cartier eyewear at Designer Eyes and receive complimentary overnight shipping! 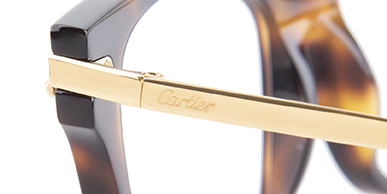 Typically, Cartier has their logo stamped on both nose pieces featured on the inside of the glasses. This is a detail that many counterfeiters neglect, as the majority of consumers do focus on minor details and only pay attention to the exterior details. Therefore, when you are examining Cartier eyeglasses for legitimacy, always pay close attention to the interior details—the nose piece in particular. Most Cartier temples are gold and hand engraved. This detail is much more difficult to replicate, and most imitators would rather not deal with it. However, some counterfeiters will attempt to reproduce it. When determining if you have purchased fake Cartier glasses, check the temple insert and look for spacing and centering issues. The Cartier temple insert should be fairly centered within the tip of the temple arm and smooth with the surface. In this case, you are looking for the opposite effect as the lens stamp. The Cartier temple insert should not be raised up above the surface of the temple arm. If you run your finger over the temple insert and feel major bumps, that is an indicator that you have purchased fake Cartier glasses. The texture may vary slightly from style to style because each one is made from a different material, but regardless of the material, the insert should never be sticking out. You should also be sure to check the gold for tarnishing and if there appears to be another metal color in certain places, this is a sure sign that the glasses are not real gold and in turn, not authentic Cartier glasses. Like what you see? 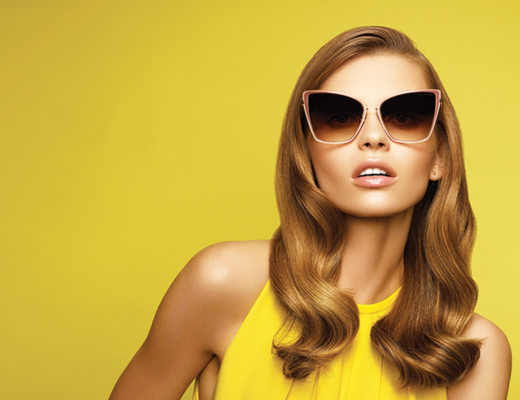 Check out the wide selection of Cartier Glasses and Cartier Sunglasses available at Designer Eyes. The Cartier signature, along with a serial number printed in small font, is located on the inside frame of each pair of glasses. This serial number should be a seven-digits long and is provided by Cartier in all glasses to confirm authenticity. Notice the price of the glasses and be wary of extremely low-priced versions. An authentic pair of Cartier eyeglasses with acetate rims will cost at $600 and a pair with platinum frames can cost up to $3,000. If the price is far below the original cost, there is a possibility that the pair is fake. 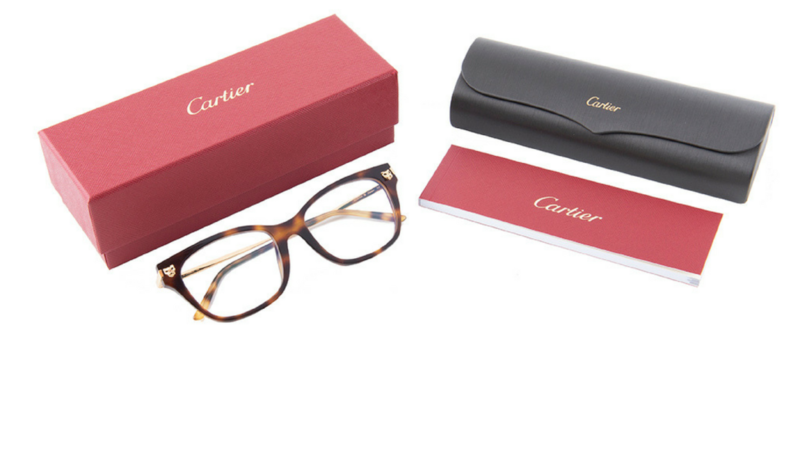 Cartier glasses are typically sold with a hard leather case, cleaning cloth and an authenticity guarantee card. Be sure to ask for a warranty card and an authenticity guarantee card when purchasing Cartier glasses. If the glasses are purchased from a private individual, this information should still be available. 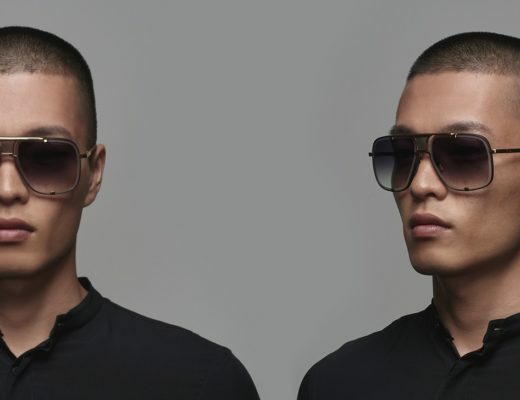 Instead of taking the chance on buying fake Cartier glasses you can purchase authentic Cartier eyeglasses from Designer Eyes and receive complimentary overnight shipping on all Cartier Eyewear. Previous Post What Sunglasses Are They Wearing in the Ocean's 8 Trailer? I’d forever want to be update on new blog posts on this internet site, saved to my bookmarks! .